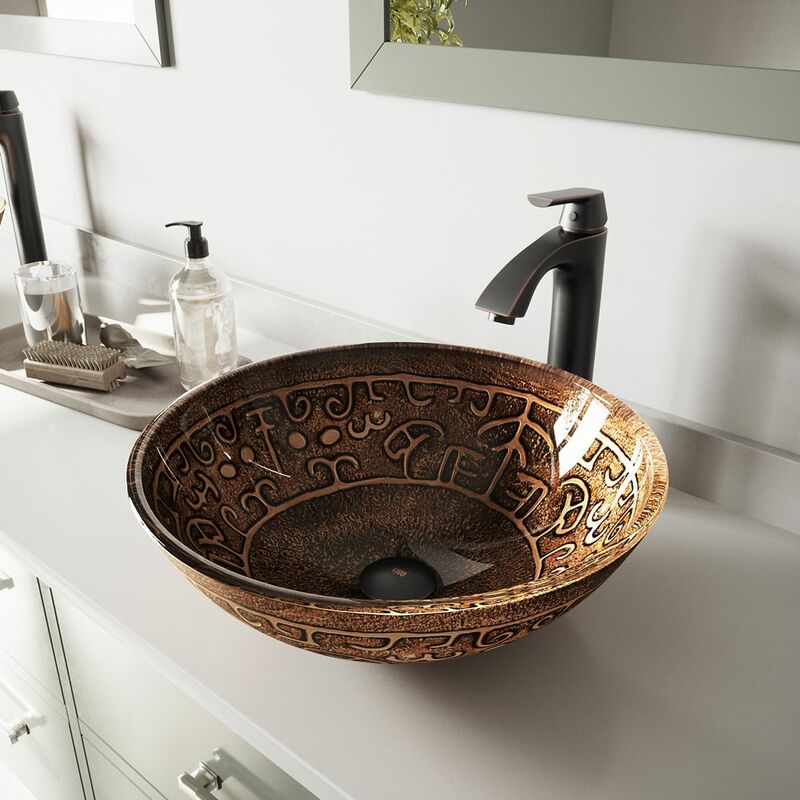 Glass Vessel Sink in Golden Greek with Linus Faucet in Antique Rubbed Bronze is rated 5.0 out of 5 by 8. Rated 5 out of 5 by Alobob from Easy to assemble. Very beautiful, my bathroom looks great. The price was right. I love it. Easy to assemble. Very beautiful, my bathroom looks great. The price was right. I love it. Rated 5 out of 5 by Mstr from Great looking sink and faucet really worth the money . Great looking sink and faucet really worth the money . Rated 5 out of 5 by satisfied from We have not installed this sink and faucet yet as we are waiting for the countertops to be instal... We have not installed this sink and faucet yet as we are waiting for the countertops to be installed. This sink is very beautiful and seems to be of very high quality. Same with the faucet. Both are really heavy and I can't wait to get everything set up. I will post a picture at a later date. Rated 5 out of 5 by Anonymous from Add Some WOW Everyone who sees this sink and faucet on my new counters are impressed. All parts were in pkg for plumber. Rated 5 out of 5 by Jbay from Beautiful faucet Top quality faucet! I would not have any other brand!!!! Rated 5 out of 5 by Jbay from Unbelievable Quality!!! I bought this a few months ago and we absolutely love the look. The quality of the sink and faucet are of the highest quality. Even the packing was exceptional. Rated 5 out of 5 by tonfarb from Absolutly beautiful I purchased this for my new bathroom..It complements it beyond well.It is beautiful in every wsy..Quality is exceptional. ...exceeded my expectations!! !